Click here if you would like to see evidence of malicious attacks launched by John R Hutchinson of the Royal Veterinary College via social media platforms attempting to discredit the authencity of these finds.JohnRHutchinson may have metally damaged and intimidated at least one American scientist but we are not going to allow the creators of fake pterosaur propaganda like Hutchinson to further intimidate, slander or defame our archive and in addition to this we are documenting evidences of his delibrate attempts where he is investing his time on photoshop and social media to launch a tirade of lies and vitriol. Hutchinson has badly disturbed Meehan's mind and he is clearly very dangerous, it is not suitable for this man to be near even grown up children and parents who have children studying at RVC should warn their loved ones to stay far away from the highy abusive Hutchinson who is known to lurk around the Royal Veterinary College. RVC staff are now under close watch and investigation since their dark web abusive activities of Hutchinson have been fully exposed. Please also note that team members of this attack are also guilty of inventing a non existent pterosaur from Hornsby Island managing to dupe and fool National Geographic and Scientific American into total shame by publishing peer reviewed fake fossils of a pterosaur that never existed. 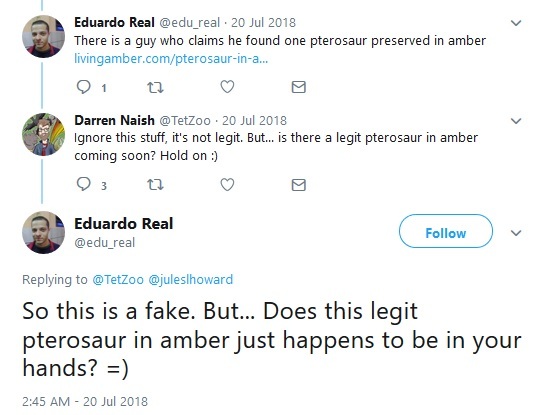 Naish also claims without evidence that our pterosaurs are fake proving he is a very amateur scientist, his vitriol includes allusions to having a supposedly real pterosaur in amber but to date has failed to produce anything except his evil rhetoric. Why exactly Hutchinson would be so evil and what exactly motivates him is very much a mystery, we have hired private investigators to dig deep into his background affairs and hope to make a full blown expose on this charlatan as soon as possible to protect any other children from being abused like Christopher Meehan. To date neither Hutchinson nor RVC have made any attempt nor had the dignity to apologise for their demented destructive and abusive behaviors. This has been floating around on the web for a bit. oh for sure. 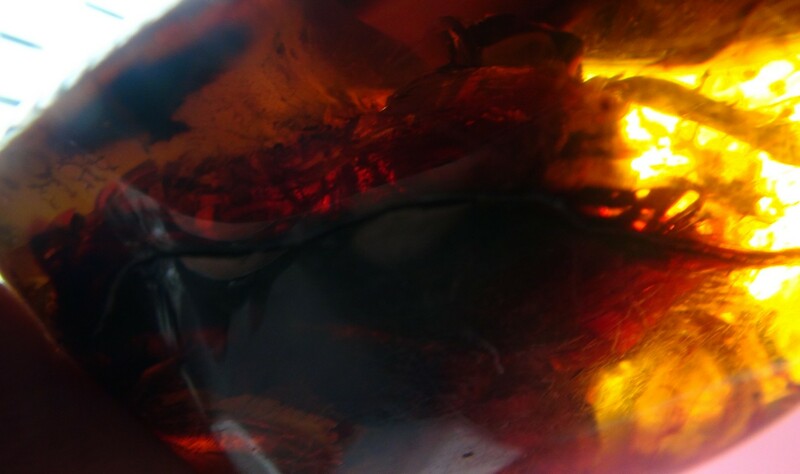 I guess when you ended that segment by saying you think it's likely that someone somewhere will eventually find a bit of pterosaur in amber, and likely had already, I got overly excited and thought you meant it was a sure thing. LOL @ lithic fundamentalist. omg. Snake in amber. STILL WAITING FOR THE PTEROSAUR, @TetZoo! If you have something valid and worthy, good for you and I look forward to seeing it. I would be happy to be wrong. But, so far the stuff that's been pushed as real is the opposite of impressive. None of the stuff on that website is even remotely convincing. And we've been through this a thousand times before; I'm not doing it again. But, some publication about this is coming soon? @TetZoo @NHMdinolab, @hugogill : Two cursory (unedited) uCT 3D images - a flapling and juvenile #pterosaur in #amber. These are UNQUESTIONABLY pterosaur remains: over a dozen individuals, from embryo to adult. "The place was a rookery of #pterodactyls." They look pretty tiny. Some shots show that the alleged pterosaurs, birds etc. 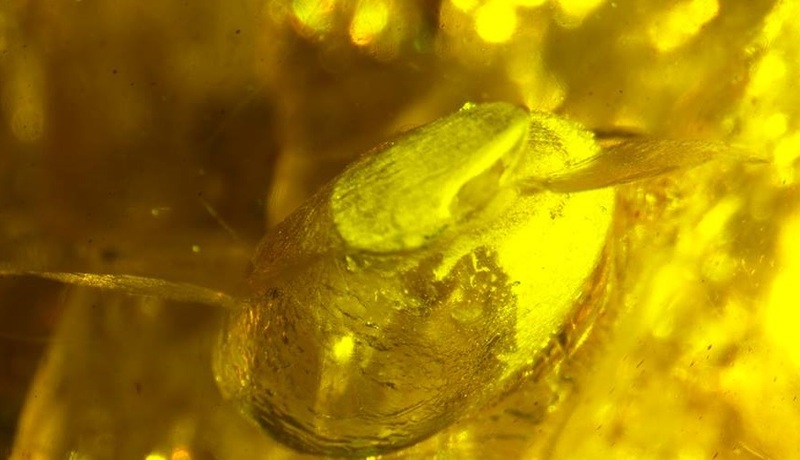 are smaller than finger nails, and that the specimens are linked to other bits of amber via metal rings - in other words, small enough to be worn as jewellery. Looks like a severe case of pareidolia. Plus how big are these bits of amber, or how small are the “pterosaurs”? 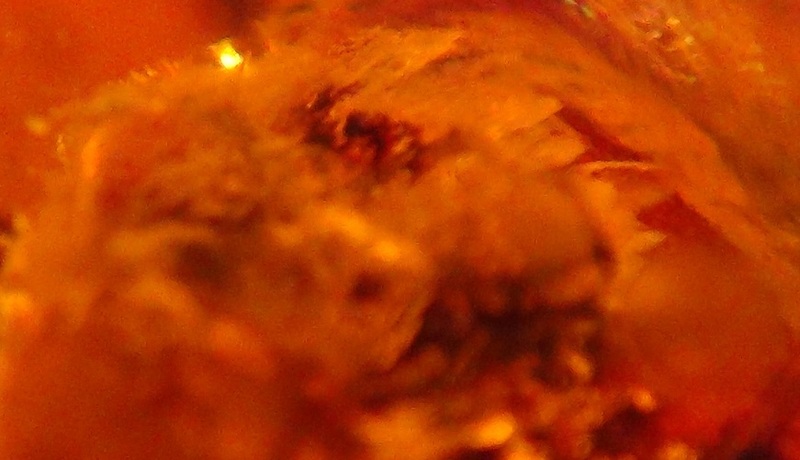 @TetZoo Is this the newest "thing", seeing pterosaurs in amber? I can't see them, all I see are air-filled bubbles and debris, ... paired with pareidolia. Do I work on amber - no. Do I know what a pterosaur should look like based on actual research and experience with fossils - yes. And the best amber fossils I have seen are very clear what they contain. These are not those. 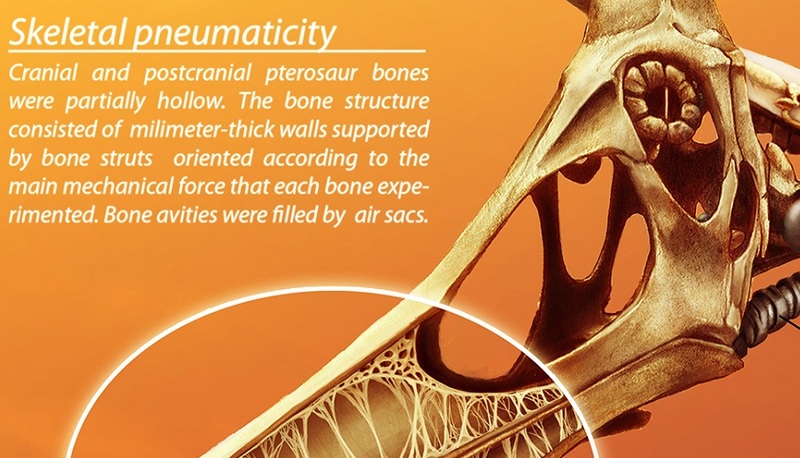 Sorry guys, I'm pretty familiar with pterosaur anatomy and what we think their soft-tissues were like, but I just can't see anything convincing in these images. These look like vaguely animal-shaped debris and detritus, not like animal parts in amber I'm familiar with. Hi Darren. Here's a link to our 'birds' in amber video with labelling as you have requested. We are working on a pterosaur version with labelling and Nano CT / FTIR: https://youtu.be/wQpANoLRKEE #pterosaurinamber #birdinamber Enjoy!! Oh, this is a great topic! Protobat, pterosaur in amber and full Gigantopithecus are definitely ones I would love to see! OMG! Amber-entombed maniraptorans must be close! Or tiny pterosaurs? I don't claim any monopoly, but I do have about 20 years experience working on pterosaurs. It's a small community and I think it reasonable to suggest I know more about them than all but about 100 people on the planet. Mark P. Witton is a British vertebrate palaeontologist, author, and palaeoartist best known for his drawings concerning pterosaurs, he sometimes works with Liz Martin-Silverstone who is notorious for publishing pterosaur studies for non pterosaur fossils making fools out of National Geographic who stupidly believed in her fake Hornsby Pterosaur. 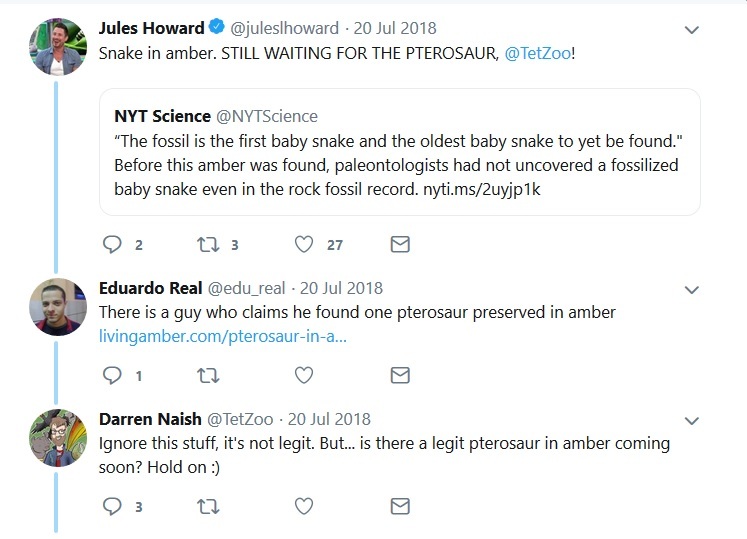 Ironic how amateur paleos who publish cheap lies in top tier journals dare attack fossil archives that when they are totally ignorant of their contents. Palaeontologist notorious for fake Canadian Pterosaur research paper based on not one real pterosaur bone making the Hornsby Island pterosaur a massive paleo hoax and cohort of Mark Witton. Part of @Palaeocast and @ScienceBorealis. not the type of scientist honest institutions should waste research budgets on. John R. Hutchinsonthis is one of the most foul-mouthed and shameless of so-called scientists he likes to defame people with nasty evil tweets and then often tries to delete the tweets containing his lies and slander to hide from RVC the true evil character he has - not the sort of person that should be allowed to teach in any institution. Harvard scientist who published the worlds first documented vegetarian spider, he is regarded by his peers as a savant and genius. Although we do archive many top grade well preserved vertebrates here is a simple picture below of a poorly preserved one just to help show how easily they can go unnoticed without careful examination. We have discovered quite a few birds in amber, they are amongst the hardest of all inclusions to find in Burmite, often they suffer from bad decay, poor amber transparency. Very rarely indeed do we find exceptional bird inclusions in amber and a few of them are shown on this website on various different pages.